June 6, 1944-the most crucial and most desperate day of World War II-Just before the D-Day invasion of Normandy France, two unsuspecting, unassuming heroes find a time machine and discover an international conspiracy to alter the course of history by altering key moments in the most pivotal and famous battles in history. In addition to Time Wars, there are 10 other SciFi stories. 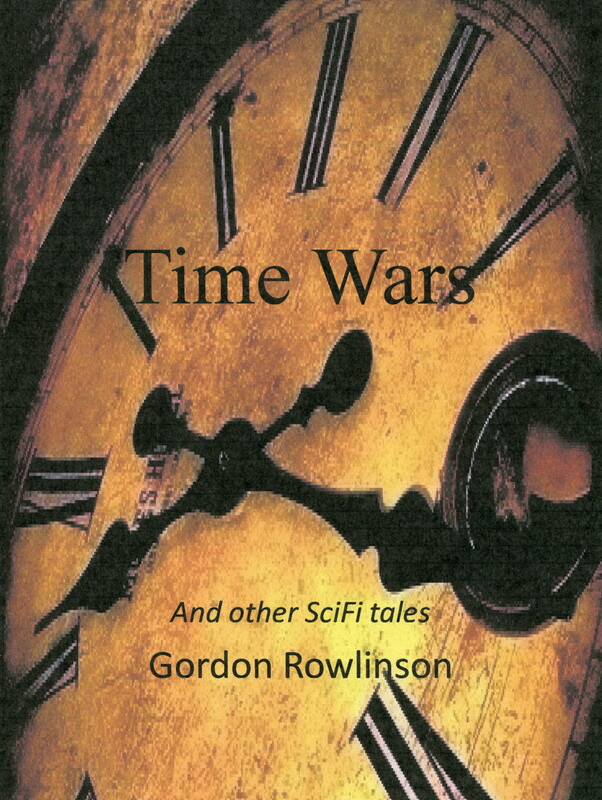 With his finger on the pulse of new Science Fiction ideas, Gordon Rowlinson provides readers with 11 stories of the unknown, the speculative and the fantastic: A man returning from a interplanetary journey finds a horrible alternative reality on earth due to a time travel change done the past. An adventure-seeker buys the ultimate vacation-a trip to the Cretaceous period, but finds himself in a strange, exotic and hostile world and in a desperate fight for survival. A researcher invents a machine that reads minds but discovers that it is harder to interpret thoughts than read them. A professor discovers that dreams are not necessarily mere constructs of the mind and can be brought into reality. No one believes a friendless inner-city child's claims that he has a huge dinosaur as a friend, until the day where the child disparately needs his huge, mystery friend. A down on his luck rock musician takes on a chance and joins a shock-rock band and finds their scary act is for real. A team of explorers try to terraform a hostile planet to create an earth-like planet. However the more they try to change the planet, the more the life on the planet counters their efforts and fights back. ..and more. The tense, trepidatious, midnight flight over the English Channel wore on the nerves of the frightened men. To Corporal Jeff Jefferson, the world was upside-down and he was on a crazy ship of fools. This was D Day�the invasion of Nazi occupied Europe and he knew anything could happen tonight. However, he had no way of knowing that the conflict he was about to enter was not World War II, but a war beyond his wildest imagination�a war fought throughout history using the dimension of time as a weapon. "I wish I could turn the clock ahead so I could know how this thing turns out," Jefferson thought as he sank down in his seat. He had a weird feeling that he wasn�t coming back from this one. He had felt confident when he boarded the plane at 10:00 PM. The huge D Day fleet of C-47 transports and the sheer number of paratroops of the biggest airdrop in history made him feel part of something big. Earlier, he and several others had said prayers in several denominations and his anxiety had disappeared. Now half way to the drop point, he didn't want to think about the cold blackness of the water only 300 feet below or how many things could go wrong. "Concentrate on your training," he thought as he listened to the droning hum of the plane's engines. They had been given anti-air sickness pills, but instead of helping, they only seemed to make him anxious and groggy. He checked his equipment again. In addition to his jump suit, helmet and boots, he was carrying: main and reserve chutes; Mae West; Springfield rifle; .45 pistol; gloves; trench knife; jump knife; machete; cartridge belt; two cans of machine gun ammo; anti-tank mine; four blocks of TNT; entrenching tool; two blasting caps; three first aid kits with two morphine needles; gas mask; canteen of water; three days supply of K rations; two day supply of D Rations; anti-tank grenade; six fragmentation grenades; blanket; and a change of socks. The red overhead light came on and interrupted Jefferson's scattered, scrambled thoughts. It was only four minutes to the drop point. "Get ready!" The jump master�s voice broke the silence. "Stand up!" was the next command. The men responded. "Hook up!" Every man on the plane carefully hooked his static line to the overhead cable. "Check your equipment!" Every man checked the connections of the man directly in front of him. The jump door was open now. "Sound off for equipment check!" Each man sounded off his jump number and said "OK."
One by one, the men moved to the front of the plane and out the jump door. When his turn came, Jefferson was relieved to feel the military training take over as he followed his comrades out the door and into the mmysterious, black void of the French night. There was a three second delay as he passed through the propeller wash and was hammered by the violent opening shock of the American T-5 military parachute. Almost immediately, came the second shock of his body slamming into the Normandy farmland. The hard impact stunned him. Still he quickly cut away his chute with his jump knife and looked up at his surroundings. He was in a farmer�s field and there was no sign of German resistance yet. Several meters away were several hedgerows. His orders were to regroup with other paratroopers and capture a small bridge. But the darkness and the drop completely disoriented him and made him unsure of where to go next. In the moonlight, he could see a pale colored object near a hedgerow. He cautiously stalked towards the object to investigate. As he drew nearer, he became more confused. Lying in the grass was a woman in a strange old fashioned dress. Next to her was a large broad sword that looked like an antique weapon from the Middle Ages. As he got closer, he could see she was seriously injured and was bleeding from a deep gash in her arm. The wound would be dangerous if he didn�t stop the bleeding. "French?" he asked as he got out his first aid kit. He wondered what this strangely dressed woman was doing with an old broadsword in the middle of the French night. "No. Just got out of there in time," she said in a thick Southern accent. Jefferson dropped his pack and quickly got out the first aid kit. By applying a tourniquet and bandage, he managed to stop most of the bleeding. Then he injected the strange woman with morphine to kill the pain. "Thank you," the wounded woman murmured. As the woman relaxed, an object dropped from her hand and rolled towards Jefferson. He slowly picked it up and examined it in the moonlight. The strange thing was in the shape of a pyramid with the corners rounded. On one side, a very small display read 1:30 6 6 1944. That was today's date and time. After looking the crazy thing over, he had no idea what it was. Was it a clock? Why would someone have a time piece shaped in such an awkward shape? There was an immediate flash of light. The bright sunlight momentarily stunned Jefferson. When his eyes adjusted, he noticed the landscape had changed. He and the strange woman were now in a meadow. The sun was high in the sky, but the ground appeared soggy from a recent shower. In a nearby clearing, a large army carrying colorful French banners was advancing on an army on a hill. The army on the high ground, was neatly organized in formations of Longbowman on the ether side of dismounted knights and man-at-arms. The Longbowmen launched waves of arrows into the French advance. Jefferson could hear the desperate, angry shouts from the French as thousands of arrows fell on them like deadly rain. The front lines of white-coated crossbowmen and chain mail armored French infantry suffered a terrible toll, but still continued to advance uphill. The French crossbowmen returned fire, but could not rewind their crossbows and fire at the same rate as the enemy. He looked at the pyramid object. The display on the object read: 11:20 7 7 1346. He shook the woman. "Where the hell are we? Is this real?" he shouted.